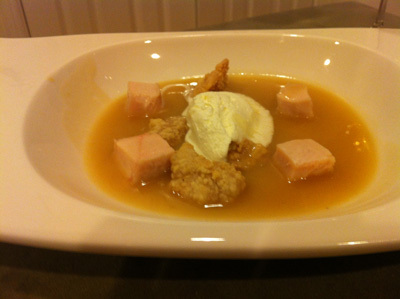 This is a variation of the Mushroom stock created from Heston Blumenthal at Home. 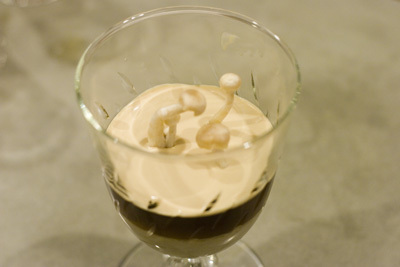 It’s great in the mushroom parfait and cappuccino I served on NYE 2012 and is a great vegetarian substitute for any beef based stock. 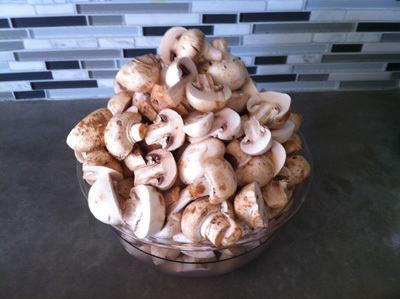 The mushrooms used here have great flavor and a heart taste with plenty of umami. 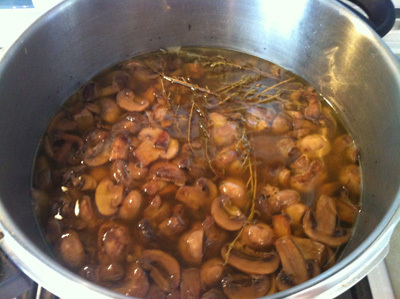 Madiera is a great flavor accompaniment for mushrooms and also adds a lot of body to the stock. I always use a pressure cooker to make my stocks because it’s so much more efficient and the sealed lid ensures you don’t lose any of those great flavors to evaporation. If 3kg of water in your pressure cooker comes to more than 2/3 full cut the recipe in half. Pressure cookers should never be more than 2/3 full with water. If you plan to use this stock for the mushroom parfait ensure you give yourself a few days for the stock to freeze and then ice filter. 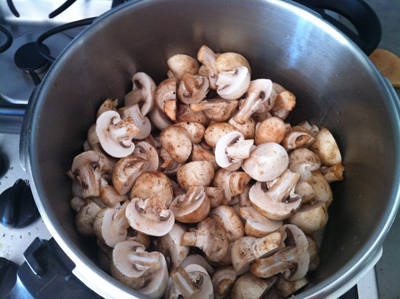 Add the mushrooms and stir to coat them evenly in the butter. Cook until golden brown (about 20 – 30 min). 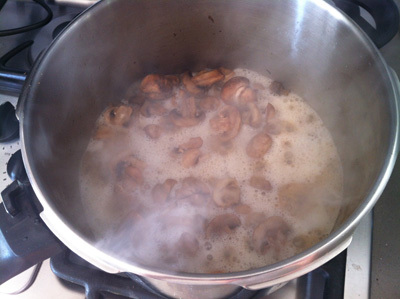 The mushrooms will give off a lot of water during the cooking process. 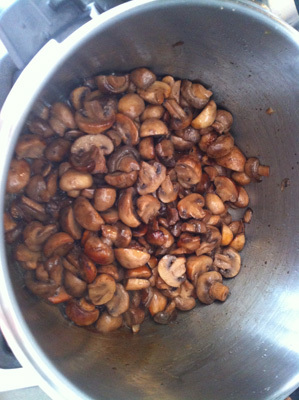 It’s important to let all this water seep out and evaporate so that the mushrooms have a chance to brown. Pour in the Madiera and scrape the bottom and sides of the pot to remove any stuck on brown bits (this is called deglazing). Cook until the Madiera has reduced to a thick syrup. 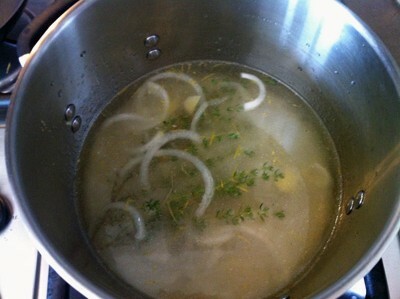 Add 3kg of cold tap water, the thyme, and the peppercorns and put the lid on. Bring up to full pressure (guage 2) over high heat and then reduce to very low and cook for 30 minutes. 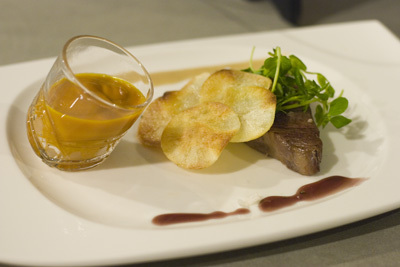 Remove the pressure cooker from heat and let cool until fully de-pressurized. Remove the lid (away from you to avoid the steam) and strain the liquid through a sieve into a saucepan. 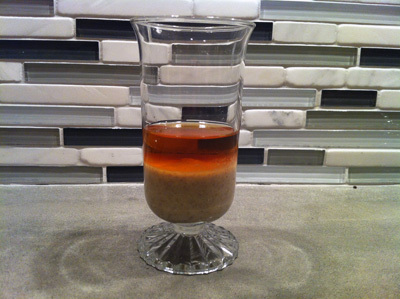 Reduce the liquid by half over a high heat then pass through a sieve lined with a double layer of cheesecloth. Cool completely and refrigerate or freeze until needed.